Data communication, even global data communication, is not new technology. Data communication systems have been firmly established in the UK for over 160 years. The electrical telegraph, the forerunner of modern data communications, was invented as far back as 1809. In 1839, the first commercial telegraph system was launched in the UK. The first functional submarine transatlantic telegraph cable was laid in 1858. The first message carried was from Queen Victoria to President Buchanan of the United States. Sadly the 1858 cable lasted less than 3 months. 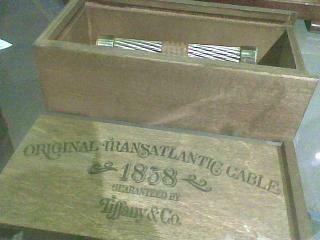 The first reliable transatlantic telegraph cable was completed on 27 July 1866. Within 29 years of its first installation, the telegraph network crossed the oceans to every continent but Antarctica, making instant global data communication possible for the first time. The Telegraph Act 1863 Section 45 created an offence of improperly divulging "to any person the purport of any message". Section 20 of the Telegraph Act 1868 made it an offence to disclose or intercept a telegram, with a 12 month prison sentence. (This act was only repealed by Statutory Instrument 2001/1149 in 2001). In 1880, Henry Fawcett was appointed UK Postmaster-General. He was a recognised authority on economics, and responsible for introducing many innovations in communications, such as parcel post, postal orders, and licensing changes to permit payphones and trunk lines. In the same year, the politician Henry Hartley Fowler was elected to the UK Parliament as the Liberal MP for Wolverhampton. The need for privacy and security in telecommunications was an issue that H. H. Fowler recognised. On 13 March 1884, he asked the Post Master General Henry Fawcett a question concerning the inviolability of telegrams. On 28 January 2009 (125 years later) Baroness Sue Miller of Chilthorne Domer put the same question to Stephen Carter, UK Minister for Communications, Technology and Broadcasting (replacing the word 'telegram' with the modern term 'datagram'). Here are the two questions, and corresponding answers presented side by side. MR. H. H. FOWLER asked the Postmaster General, Whether the clerks in the telegraph offices are prohibited from giving any information as to the persons sending telegrams, the persons to whom they are sent, and the contents of such telegrams; and, whether any official disclosing any such information would be dismissed from the public service? THE PARLIAMENTARY UNDER-SECRETARY OF STATE FOR COMMUNICATIONS, TECHNOLOGY AND BROADCASTING (LORD CARTER OF BARNES): This department would expect internet service providers and any other company to ensure that their operations conform to the relevant laws on data and access to data. Disciplinary measures are a matter for the organisations concerned. We do not monitor the terms of employment in the internet service sector.